Sandwiched between Brisbane and the New South Wales border in southeastern Queensland, the Gold Coast conurbation is a hugely popular beach-based tourist destination. It is essentially a collection of cities, towns and villages along the coast fronted by excellent surfing beaches and pockmarked by waterways. The Gold Coast has a hugely varied nightlife, offering just about any evening’s entertainment you could dream up. From laid-back surfer’s bars and jazzy cocktail joints to neon-drenched nightclubs and hip indie cinemas, this buzzing beachfront city has it all. The Gold Coast is an ideal city for a fun-filled, stress-free family holiday. The city is laid-back, and - while it does offer an electrifying nightlife - has a safe and kid-friendly atmosphere. You’ll find theme parks, educational adventures, and of course, plenty of soft sweeping beachfront. While the Gold Coast is known as a paradise for adrenaline-seeking surfers, this sun-soaked city has a lot to offer for culture-lovers too. With a vibrant performing arts scene, a strong selection of fascinating museums, and no shortage of breathtaking landmarks - from grand traditional churches to flashy modern architecture - the Gold Coast is full of intrigue. Being a city spread along a 70 kilometre coastline, finding somewhere attractive to stay in the Gold Coast is hardly a challenge. Picking your perfect location simply depends on your requirements. Everything from bustling family hotels to luxury boutiques dominate the Surfers Paradise and Broadbeach regions; however, if you’re searching for something more affordable and relaxed, it’s better to head towards Main Beach, Miami, Burleigh, Kirra and Coolangatta. It’s pretty hard to deny that one of the most exciting experiences when traveling is seeing how many purchases you can cram into your suitcase on your return. Filled with sprawling shopping centres, tiny exclusive boutiques and jostling market wares, the Gold Coast won’t disappoint as a destination for shopping. Gold Coast locals love spending time outside, so it’s no surprise that the beachside city is jam-packed with cafes, restaurants and various interesting eateries. Boasting exciting cuisines from Asian to Mexican, Italian to Modern Australian, the food is as multicultural as the city itself. You are highly unlikely to leave the Gold Coast feeling disappointed or hungry! The Gold Coast is an action-packed city, perfectly suited for families and adventure seekers. There’s world-famous beaches, thrilling theme parks, the lesser-known hinterland and, of course, iconic attractions such as the Q1 building and Tamborine Rainforest Skywalk. Combined together, these elements provide a memorable holiday on the east coast of Australia. Being Australia’s sixth largest city and blessed with a year round sub-tropical climate, the Gold Coast has everything to offer visitors. Be it a family holiday, romantic getaway or special event, the Gold Coast spoils you with its warmth and passion for relaxation. Lively entertainment can also be found here too, with world-class theme parks, adrenalin-fueled water sports and indulgent shopping offered in abundance. The Gold Coast is loaded with shopping malls, duty-free stores and boutiques - in particular at Surfers Paradise – and is the best place in Queensland for high-end goods. Souvenirs, designer labels, and sports goods are widely available here, while handicrafts and souvenirs can also be had at regional weekend markets. The Gold Coast has it all; beaches, countryside, sun, malls, museums and bustle, and everyone is catered for. The beaches are of course the main attraction and they go from the tourist-surf-heavy Surfers Paradise in the heart of the action, down two more measured shores toward the south and on nearby islands. The Gold Coast is all about the beach and there are miles of sand here where swimming and surfing can be enjoyed almost year round. 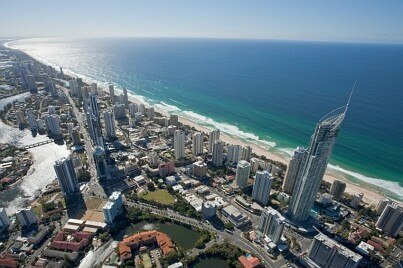 Surfers Paradise is the main beach and the most built up town on the Gold Coast. Consequently it also has the bulk of the attractions, including noteworthy museums and galleries, as well as the best shopping. There is more eating choice in the Gold Coast than anywhere else in Australia. Unless you plan on heading to one of the top spots, where you will need to book, you can just head out in any of the beaches or towns and check out any number of quality places. The sun is particularly fierce in this part of the world and using a high-factor, brand name sun block, plus a hat and sunglasses, is a must when on the beach. Despite being a huge conurbation of towns, villages and suburbs, getting about by public transport is not a problem. The Gold Coast - set on Australia’s east coast in the vast state of Queensland - is a laid-back, sun-specked city. It boasts swathes of powdery beachfront, perfect for lazy days of catching rays, or swimming in the warm aquamarine ocean. The city is has theme parks for the kids, and a buzzing nightlife of fine-dining restaurants and lively bars for the adults. The Gold Coast is also crowned by a deep, lush rainforest where you'll find shimmering waterfalls and rare wildlife.